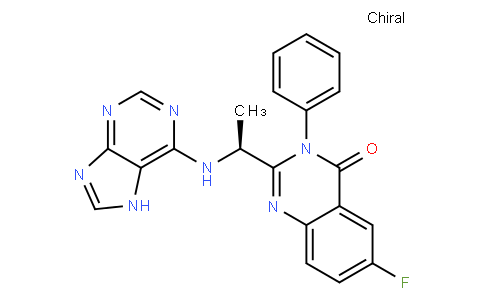 Acalisib, also known as GS-9820, is an inhibitor of the beta and delta isoforms of the 110 kDa catalytic subunit of class IA phosphoinositide-3 kinases (PI3K) with potential immunomodulating and antineoplastic activities. p110beta/delta PI3K inhibitor GS-9820 inhibits the activity of PI3K, thereby preventing the production of the second messenger phosphatidylinositol-3,4,5-trisphosphate (PIP3), which decreases tumor cell proliferation and induces cell death. PI3K-mediated signaling is often dysregulated in cancer cells; the targeted inhibition of PI3K is designed to preserve PI3K signaling in normal, non-neoplastic cells. Check for active clinical trials or closed clinical trials using this agent.